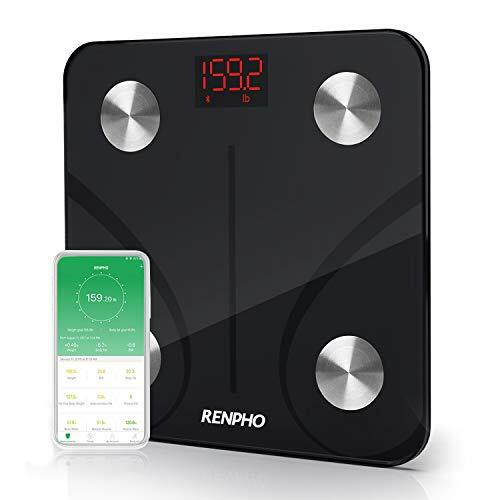 RENPHO brand is devoted and dedicated to the design, development and sales of digital scale.Specifications:Capacity: 396lb/180kg Division: 0.2lb/50gUnits: kg/lb(switch units through App)Features: Auto on/offMaterial: 5mm Tempered Glass PlatformDispaly: Backlit LED displayPower: 31.5V AAA batteries includedIndications: Low Battery & Overload IndicationUsing Tips: 1.If you are pregnant/pacemaker or other internal device holder, you should not over rely on the data provided by this product.2.For best accuracy, please lay the scale on hard and flat surface, and stand on the central area. 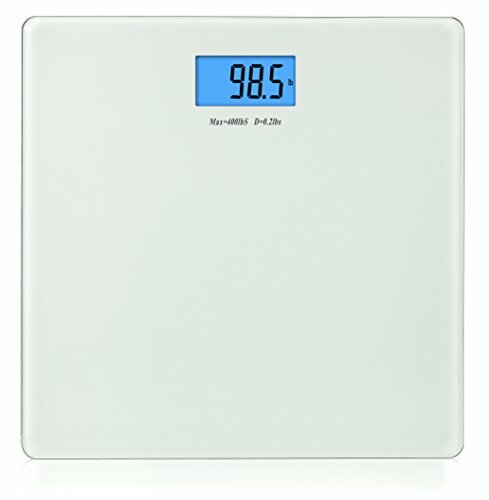 Avoid carpet or soft surface.3.To avoid inaccurate weight results, please recalibrate the scale after physically moving or shifting it or when replacing the batteries.4.To calibrate, apply weight on the scale, then step off and wait for the LED screen to display ""0.0"". Then, step back on the scale to weigh with accurate results. 5.During weighing, the indication will be flashing on the display, wait till the indications stop flashing. Your weight will be displayed for about 15 seconds, then switch off automatically.6.Please stand on the scale with DRY & BARE feet and make sure your feet are touch 4 electrode areas on the surface of the scale before use when taking body fat and other data. And please also noted that you need to turn on the Bluetooth on your Phone and make a connection with the Bluetooth Scale via App (names RENPHO).7.Please change a new battery when ""LO"" appears on the screen which indicates that the battery is out of power. ""Err""showed on the LED indicates overload.RENPHO ensures 100% customer satisfaction with all purchases made from us, whenever you have any problem with our products, don't hesitate to contact us. Smart App Syncs with Fitness Apps: Over Millions happy global users, RENPHO App syncs with Samsung Health, Apple Health, Google Fit, and Fitbit App. 13 Essential Measurements: Scale shows body weight, data including Weight, BMI, Body Fat Percentage stores to app. You can weigh yourself anytime WITHOUT your phone. The data will sync to the app once it is connected again. User Friendly App: Download RENPHO app at App Store/Google Play. RENPHO App works with Bluetooth 4.0 and above. Local Customer Service: Customer Satisfied Guarantee and Local U.S. Customer Service based office. 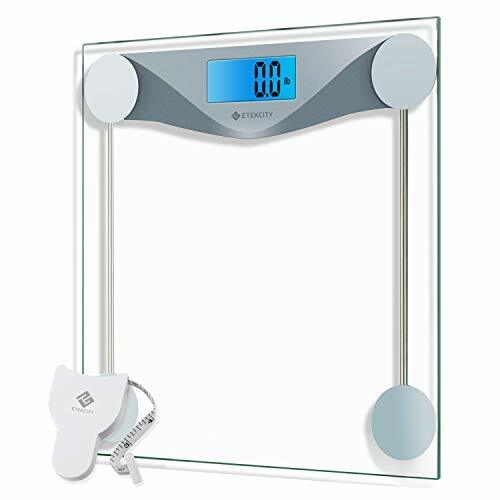 Weight Capacity: 180 kg (400 lbs) Graduation: 0.1kg (0.2lbs) Units: Kg / Lbs Platform: 6mm tempered glass Auto-Multifunction: Low battery/ Overload indication; Auto on/Off/ Zero LCD Display: 3.1"
Overview: The BalanceFrom High Accuracy Digital Bathroom Scales use four latest version of precision sensors to catch your weight accurately and consistently every time. 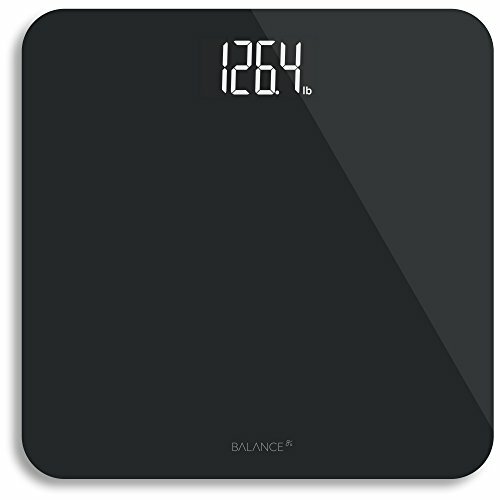 The BalanceFrom "Smart Step-On" technology offers you instant and accurate measurements upon step onto the scale; no more tapping is required to turn the scale on!! Automatic turning off technology is another user-friendly design. Display: Extra large display with cool blue backlight and extra large font and bold numbers make it easy for you to read your results even in dimly light area. The Extra thick tempered sturdy non-slip and large platform is more than enough for 400 lb. (180 kg) at 0.2 lb. (0.1 kg) graduation increments. After all, keeping you safe and balanced is what BalanceFrom is all about. Runs on AAA batteries (included). Customer Comments: This scale is so user-friendly and fits my budget well since it's at a lower price than other competitors, BUT, it actually uses a lot more material and efforts to keep high quality. The big bright display with big numbers, the thicker tempered platform, the customer service, the "Smart Step-On" technology and automatic turning off, all these features make my purchase so worthwhile. Thank you for the excellent product... --Otto. How to use weight trend function? The scale measured your weight at 150 pounds and your friend's weight at 120 pounds the last time. Now you lose 2 pounds and your friend gains 1 pound. When you step on the scale, it displays 148 pounds and indicates that 2 pounds is decreased; when your friend step on the scale, it displays 121 pounds and indicates that 1 pound is increased. The glass platform is slippery when wet. Make sure the platform is dry before stepping on for measurement. This scale is not intended for commercial use. Always place the scale on a hard, dry and flat surface before measurement. Individuals with the following conditions may not use this scale: pregnant women, those with symptoms of edema, those on dialysis treatment, and those who use heart pacemakers or other implanted medical devices. Consult your primary-care doctor or physician before use. Before measurement, always remove shoes and socks for best weight result accuracy. Weight range of this scale is 11lbs/5kg Min. to 400lbs/180kg Max. Staying fit and healthy is a numbers game that's why this professional digital scale uses four highprecision sensors to instantly deliver trustworthy results with a 0.2 lb accuracy resolution. Reading your results is simple thanks to the sizeable, sharp LCD display and seamless unit conversion with a single button. 1. For best accuracy, please place the digital bathroom scale on hard and flat surface, and stand on the central area. Avoid carpet or soft surface. 3.To avoid inaccurate weight results, please re-calibrate the scale after physically moving or shifting it or when replacing the batteries. 4.To calibrate, apply weight on the scale, then step off and wait for the LED screen to display "0.0". Then, step back on the scale to weigh with accurate results. 5.Please stand on the scale with DRY & BARE feet and make sure your feet are touch 4 electrode areas on the surface of the scale before use when taking body fat and other data. And please also noted that you need to turn on the Bluetooth on your Phone and make a connection with the Bluetooth Scale via App (names RENPHO). 6.Please change a new battery when ""LO"" appears on the screen which indicates that the battery is out of power. ""Err""showed on the LED indicates overload. RENPHO ensures 100% customer satisfaction with all purchases made from us, whenever you have any problem with our products, don't hesitate to contact us. Smart App Syncs with Fitness Apps - Over Million happy global users, RENPHO App syncs with Samsung Health, Apple Health, Google Fit, and Fitbit App. Free Friendly App - Download RENPHO app for FREE at App Store/Google Play. RENPHO App works with Bluetooth 4.0 and above. High Quality Product - Auto calibration, high precision sensors measure in increments of 0.2 lb/0.05 kg with 396lbs/180kg capacity. 4 sensitive electrodes, 6mm tempered glass platform, 3 x AAA batteries included. FDA/CE/FCC/ROHS Certificated. 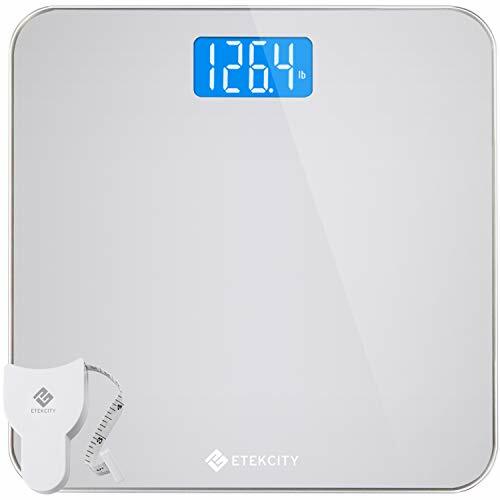 Etekcity Smart Scale is your healthy assistant, which can measure 13 body metrics to show on Vesync Fit APP and can also sync with Fitness APP. Bluetooth scale supports you and your family to share one scale to manage health metrics and improve health condition. Keep you and your family healthy. 2. For best accuracy, please lay the digital bathroom scale on hard and flat surface, and stand on the central area. Avoid carpet or soft surface. 5.This body scale is just for family daily use and should not be used as medical usage. You should consult a professional doctor when undertaking any diet or exercise program. SMART APP SYNCS WITH FITNESS APPS - Easy setup app syncs with Samsung Health, Fitbit, Apple Health, and Google Fit. RENPHO connects with the apps to help you set goals, save historical data and track your daily, weekly, and monthly progress. Already have millions of satisfied users. 13 ESSENTIAL MEASUREMENTS - The RENPHO app measures weight, Body Fat%, BMI, Muscle Mass, Bone Mass, and more. It display graphs that track progress in these various metrics. You can weigh anytime WITHOUT turning on the APP. The data will sync to the app once it is connected again! BLUETOOTH CONNECTIVITY - Download user-friendly RENPHO APP through the App Store or Google Play and connect via Bluetooth 4.0 or above version. The APP only takes up 20 MB of storage. 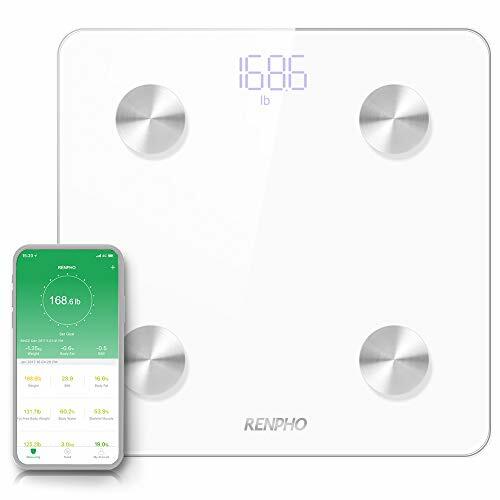 ONE SCALE FOR THE WHOLE FAMILY - The RENPHO Body Scale allows you to track your whole family's weight and health information through multiple accounts/profiles. Monitor your family's health and start a healthy lifestyle. You can also share your progress with your family and friends on social media for friendly competition. 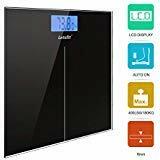 100% SATISFACTION GUARANTEED - Auto calibration, body composition analyzer, 5mm tempered glass, 4 sensitive electrodes, 3 x AAA batteries included. FDA/CE/FCC/ROHS Certificated. 1-year warranty and local US-based customers service support. 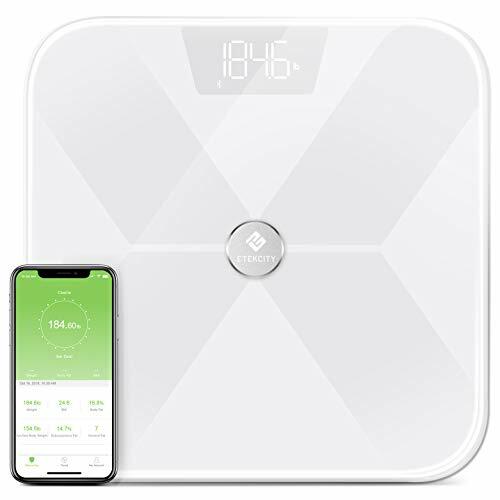 Body+ is a Wi-Fi smart scale that features highly accurate weight (+-0.1kg), full body composition, and seamless tracking in the free Health Mate app (iOS8+ and Android 5+) to help you reach your goals. Syncs with Apple Watch plus more than 100 top health and fitness apps including Apple Health, Fitbit and Google Fit. ACCURATE BY DESIGN - Wi-Fi ensures that your measurement is accurate anywhere in the world, and Position Control Technology guides you into the correct stance so that each weigh-in is precise. 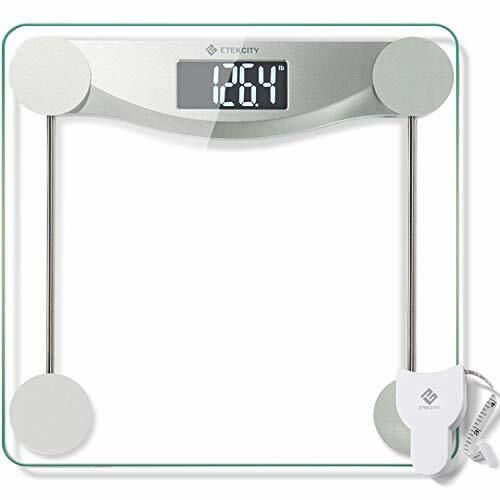 MULTI-USER FRIENDLY - Up to 8 users can weigh themselves and access their personal weight histories, as the scale automatically recognizes who's who. FOR EVERY STAGE OF LIFE - Keep track of the whole family's growth with Pregnancy Tracker (healthy weight gain range and obstetrician-reviewed advice) and Baby Mode, to track the youngest members. NUTRITION TRACKING - Set a weight goal and manage your daily calorie budget. DAILY WEATHER FORECAST - Step on your scale to enjoy a localized weather report to help plan your day. ALEXA, ASK WITHINGS - Now your voice can help you manage your weight with an Alexa Skill that works with Health Mate. 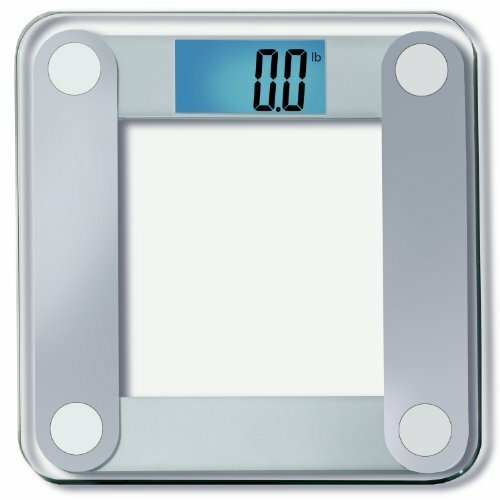 This scales for body weight can store unlimited users' profiles and automatically recognize them as soon as they step on the weight scale, making weighing easy as pie. Since all you have to do is to step on the digital scale barefoot, then this scales digital weight will identify who you are based on past records. Our digital scale supports you and your family to share 1 smart scale to manage health metrics and improve health condition, aiming at keeping you and your family healthy. Every weigh-in data appears in the ARBOLEAF app automatically in the form of clear trends graph. This smart scale enables you to track progress easily only with your fingertips, stay motivated along your fitness journey and help you reach your goal faster! Seeing progress being made is the key to motivation, fitness and performance breakthroughs. 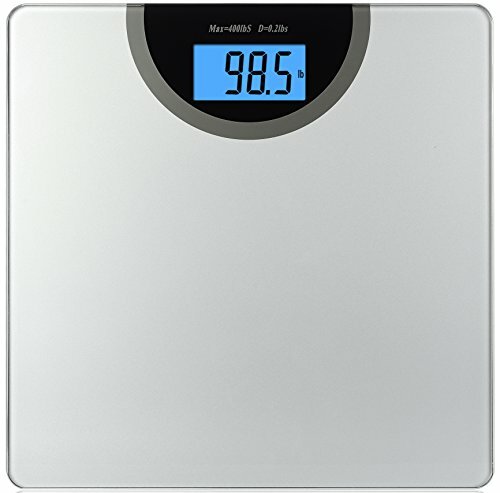 A better smart scales digital weight bathroom scale will take you further toward reaching your goal. 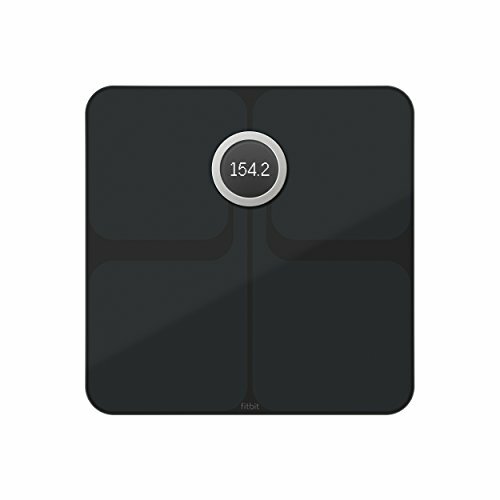 This intelligent scale with bmi works as your fitness assistant and allows you to know your body metrics better. 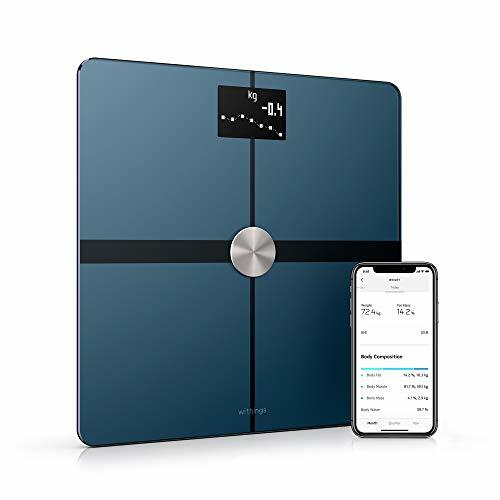 With these in-depth analyses, our scales digital weight with bluetooth scale allows you to see small changes in your weight every day, so that helps to keep food intake & exercise along with your fitness journey. Sync to Your Favorite Fitness App! 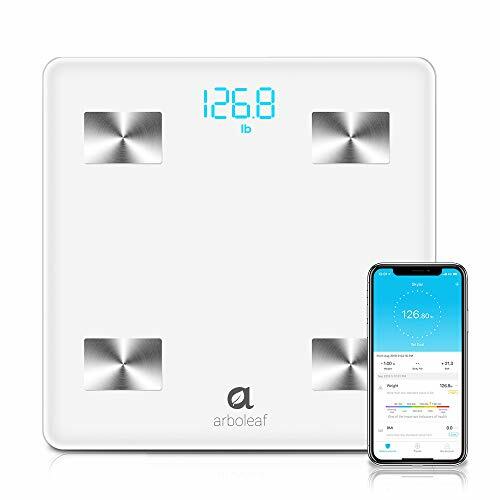 Download "ARBOLEAF" app through Apple Store or Google Play!, connect your weight scale with phone via Bluetooth 4.0, support for Android 4.0 & IOS 8.0 or above system!. This app can smartly feed your scales digital weight and body fat data to Apple Health, Google Fit & Fitbit App anytime, anywhere! Just add it to your cart now! 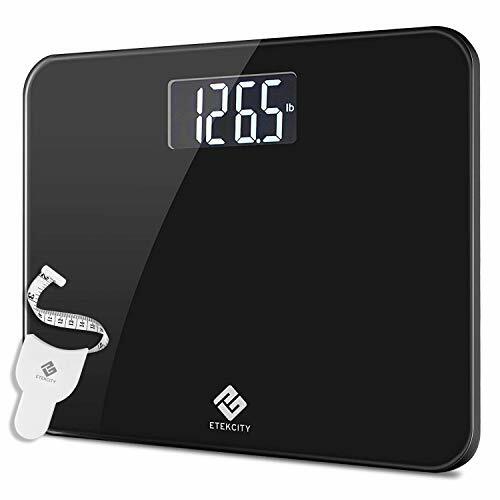 SYNCS WITH FITNESS APP Syncing with easy-to-use smart scale app & supporting Bluetooth 4.0, Android 4.3 & IOS 8.0 or above system, this scales digital weight can feed your health body fat scale data to your favorite fitness app including APPLE HEALTH, GOOGLE FIT & FITBIT APP - already used by over millions satisfied users. 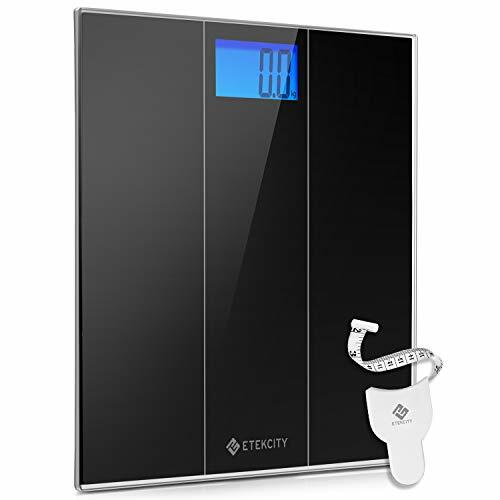 1 STEP, 10 KEY BODY COMPOSITION ANALYSIS This Bluetooth weight scale can tell you 10 essential body compositions data including weight, body fat %, body type, visceral fat, body water %, muscle mass, bone mass, BMR, BIM, metabolic age. Clear trends graph allows you to track progress easily with your fingertips and stay motivated along your fitness journey only by 1 simple step to scales digital weight. 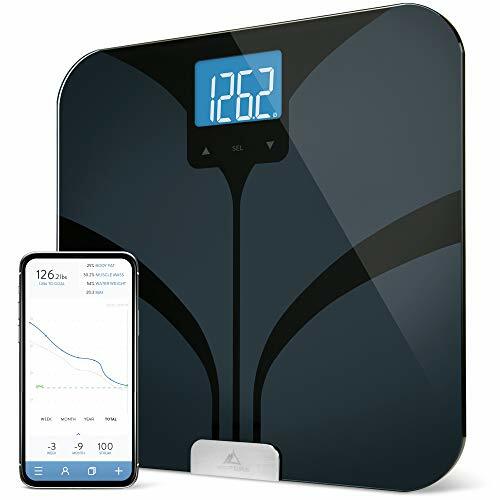 HIGHLY ACCURATE & FULLY AUTOMATIC 4 high precision sensors & 4 sensitive electrodes work hard together to ensure this smart scale accurate & consistent body composition analysis. Just step on the weight scales bathroom to get timely readings - no more tapping to activate scales digital weight! Auto-connection, auto-recognition, auto ON/OFF, auto-zero, auto-calibration, low battery & overload indication. Just a simple, clear step towards a healthier lifestyle. U.S. CUSTOMER SERVICE & 12 MONTHS WARRANTY  Any problems just dial our free Hotline 1-800-658-1148 (M-F: 9:00 am - 5:00 pm, US Central Time) for 100% Satisfaction After-Sale Service. We are so confident that our Bluetooth digital scale is manufactured under strict quality standards to ensure you the best weighing experience with the most professional Customer Service Team. Totally no risk of you! DESIGNED FOR YOU: We designed this bathroom/physicians scale as an easy and elegant way to measure weight, so you can meet your health goals. It s designed for everyday use right out of the box, with no complicated set-up just step on to view your results. The sleek tempered glass platform and large, backlit screen are both stylish and functional. PRODUCT DETAILS: Results are easy to read on an extra-large, backlit LCD screen. Scale calibrates itself automatically just step on to weigh yourself, and the scale will turn off after you finish. Non-slip, scratch-resistant feet keep the scale in place without damaging your bathroom floor. 4 weighing sensors work together to give more precise readings, with a resolution of +/- 0.2 lb. Large, tempered glass weighing platform supports up to 400 pounds. 2 long-lasting CR2032 batteries included. TROUBLESHOOTING: Is your scale weighing 4-5 pounds too heavy? You may need to recalibrate your scale before stepping on - for more tips like this, be sure to check out our Paperless Manual upon receipt. PROVEN: #1 US Bluetooth Smart Scale brand. Our community has lost 1.5M+ lbs while giving back to charity. SECURE: Unlike other Bluetooth Smart Scale, ours establishes a secure, 1: 1 connection with each user. PHONE NOT REQUIRED TO WEIGH: Bluetooth Smart Scale shows full results and stores them to sync when phone is around. Thick 8mm tempered glass non-slip top and large 12 x 13 platform and sits 1.8 off the ground. 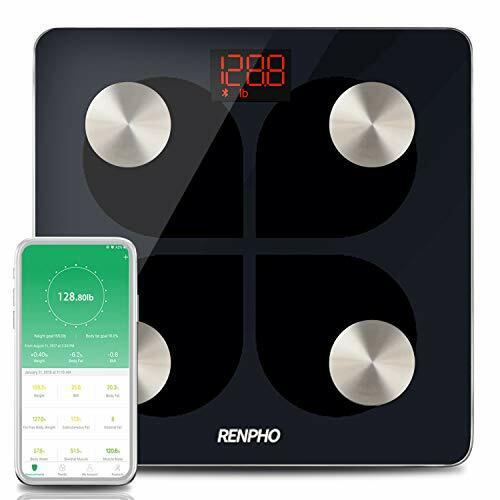 Precise measuring - Using BIA (Bioelectric Impedance Analysis) technology, RENPHO smart BMI scale can accurately track your 13 body metrics. The data will automatically sync to your phone next time, even if you don't open the app. USB Rechargeable - No more waste money on batteries! RENPHO body fat monitor is built-in long-lasting lithium battery recharges through USB cord. You can charge it with your power bank/AC adapter/laptop and so on. Only takes 3-4 hours to charge fully for a battery life of approximately 2-3 months. Premium Quality - Our high accuracy scale equipped with auto-calibrated high-precision sensors measure increments. 4 sensitive electrodes, 6mm tempered glass platform. Easy to clean also lightweight, Portable for you to carry around. Please mind the maximum weighing range of this scale is 396lbs/180kg. Smart APP - We have over millions satisfied users from all over the world! The RENPHO app can track your progress with charts and graphs, see your trend and compared to achieve your goals. It support with Samsung Health, Apple Health, Fitbit App and Google Fit, transfer your data to these app within 1 second. Moreover, it can simultaneous use by multiple people. Warranty and customer care - 100% satisfaction guarantee & local U.S.-based customer service office. We also have 12-month warranty and professional customer service team, respond within 24 hours. 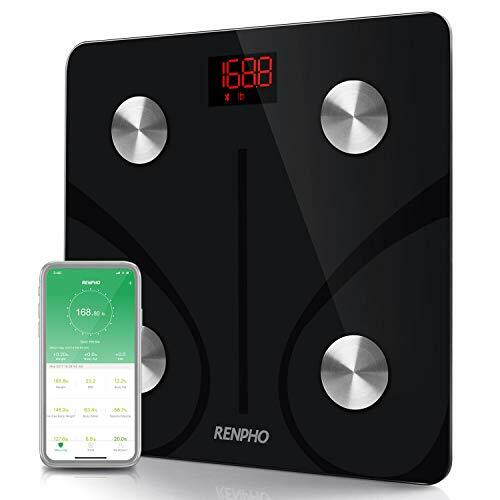 RENPHO bathroom scale is FDA/CE/FCC/ROHS Certificated. 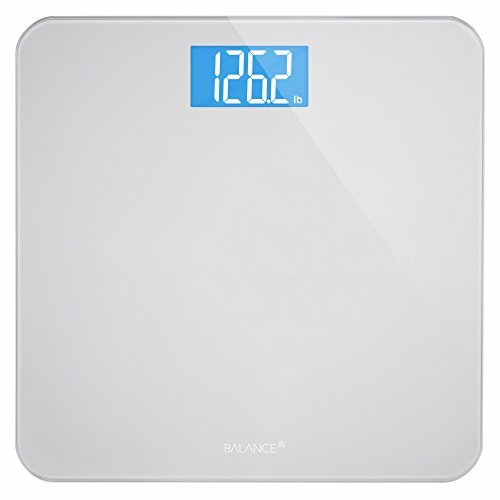 Whether you re after weight-loss, muscle gains, or maintenance, the digital scale delivers lightning-quick measurements with a 400 lb / 180 kg capacity and 0.2 lb accuracy resolution. Its stainless steel platform is auto-calibrated so you just step on it and precise results are displayed on a backlit LCD screen. 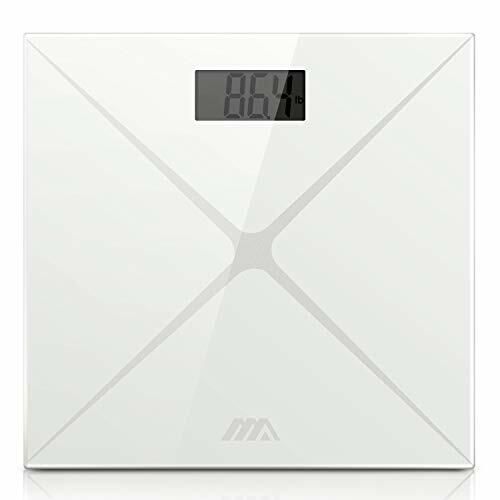 With a 400 lb (180 kg) capacity and 0.2 lb accuracy resolution, this digital scale lets you precisely track your body weight and stay motivated to achieve your fitness goals. No calibration is required just step on the platform and receive instant, reliable readings on an easy-to-read LCD display. High-end features like auto-on/off, auto-zero, low battery, and overload indication provide added convenience, while a 6 mm tempered glass platform delivers a safe, durable surface for measurement. 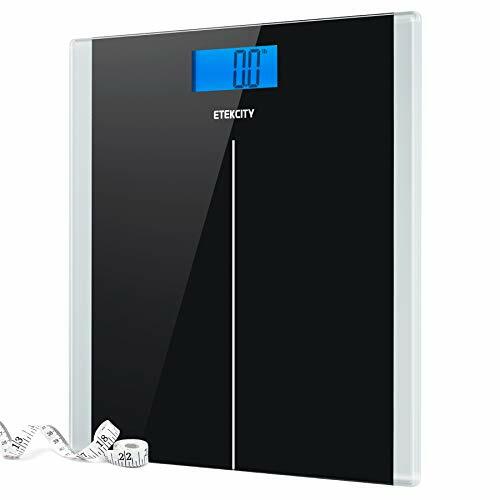 FAST & INSTANT READING: With "step-on" technology, just step onto the top to weigh yourself, no need to tap the scale to turn on, 3.15" large LCD display allows clear and instant readings. HIGH ACCURACY: Equipped with 4 high-precision sensors, the digital scale delivers accurate measurement with a 0.2lb accuracy resolution. Ideal for home, gym, office, drugstores and more. PREMIUM MATERIAL: Ultra-thin and compact 12x12 design fits anywhere around the house. High quality 6mm tempered glass platform bears weight of 11-400lb with overload indicator. VERSATILE FEATURES: Choose units from kg, lb, st. Its auto power on /off mechanism and low battery indicator extends the battery life. Anti-slip pads at the bottom ensure stability and safety. Getting and staying fit has never been easier! 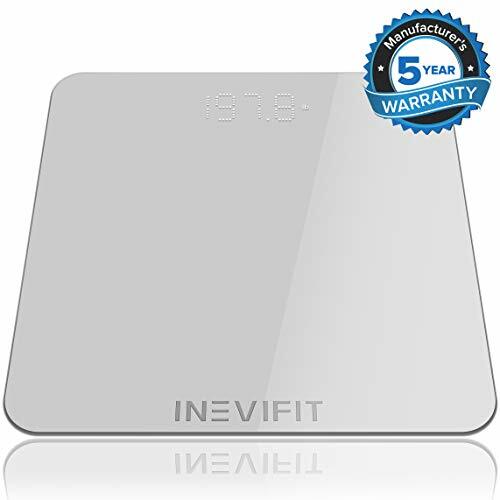 INEVIFIT has made it convenient to monitor and track your body weight by developing their all-new Bathroom Scale. Now you will be able to quickly get accurate body weight measurements so that you can track your fitness progress in seconds. This information is exactly what you need to reach your goals faster and stay motivated for the long run. The best part is that our fitness scale will for you and as many of your family members as you want. That means you will be able to focus on what matters and get that summer body you always wanted faster than ever! Consistent gains in your fitness is literally a step away! As you work on your nutrition and exercises you will be able to check up daily & weekly on your body weight to make sure you are right on track. This will allow you to meet your fitness goals faster, be able to focus on burning the unwanted fat, and live an overall healthier life. Taking control of your fitness is literally this simple! Rejuvenate the look of your bathroom or bedroom by adding this beautiful piece of technology in your home. We have designed the modern yet elegant look of our body scale right here in Southern California, and have only used the finest materials to ensure you enjoy the premium quality experience. We have used a larger LED display to allow for easy reading and upgraded the sensors to allow weighing users of up to 400lbs (180kgs). No more excuses, begin living a healthier life today! MEET YOUR FITNESS GOALS FASTER: Accurately monitor your body weight by stepping on the large 11.8" x 11.8" premium tempered glass platform to track your progress and reach your fitness goals faster. SIMPLE & CONVENIENT: The INEVIFIT Bathroom Scale is equipped with Auto-Calibrating sensors which provide you with precise measurements for you and an unlimited number of family members every time. SMART FEATURES FOR SMART USERS: Body weight measurement readings should be hassle free, so your scale has Auto-On & Auto-Off sensing technology to save battery life. 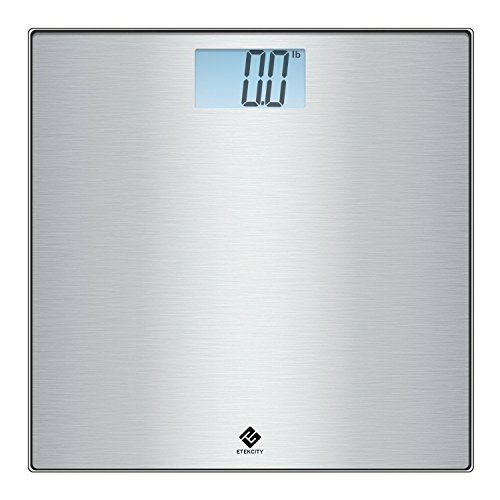 BE PROUD OF YOUR NEW BODY SCALE: We have designed its elegant look right here in Southern California, and have used a larger 3.6 LED display to allow for easy reading. Thanks to our fine quality materials and upgraded sensors it can now weigh up to 400 lbs (180 kgs). 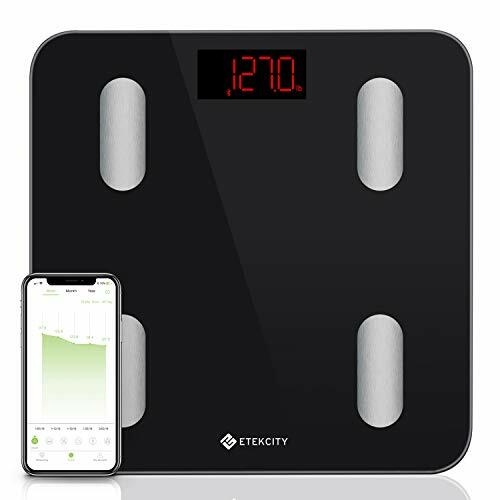 UNRIVALED CUSTOMER SERVICE: The INEVIFIT Digital Scale comes with 7-day real USA customer support and our products include the industry leading 5-year manufacturer's warranty. You can rest assure that you will be 100% satisfied with the INEVIFIT experience.